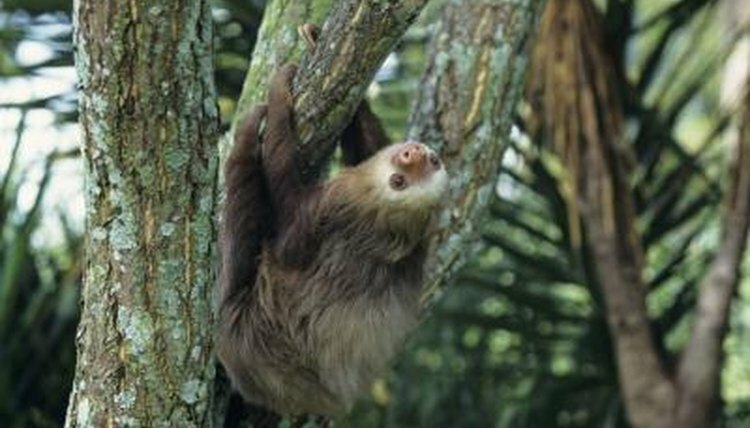 Latin America's tropical forests host the arboreal sloth, the slowest of mammals. There are two species: two-toed sloths and three-toed sloths. The former can be 27 inches long; most individuals weigh around 17 pounds. Three-toed sloths measure up to 23 inches and weigh 8 or 9 pounds. Only one subspecies, the pygmy three-toed sloth, is considered endangered by the International Union for the Conservation of Nature, but deforestation poses a threat to sloths everywhere. Sloths live in Central and South America. The Hoffmann’s two-toed sloth occurs from Nicaragua south to Peru and western Brazil. The other two-toed subspecies, the Linnaeus’s two-toed sloth, is found east of the Andes mountain range, from northern South America down to the central Amazon Basin. The pygmy three-toed sloth is found only on a Panamanian island called Isla Escudo de Veraguas. The maned three-toed sloth occurs exclusively in the coastal Atlantic rainforests of Brazil. The range of the brown-throated three-toed sloth extends from Honduras to northern Argentina. Pale-throated three-toed sloths inhabit northern South America. The rain and cloud forests where sloths live are invariably humid. The sloth is so adapted to these regions of excessive precipitation that the hair on its belly curves toward its back to allow rainwater to run off when the animal is hanging upside down. An individual sloth's home range can encompass up to 16 acres, as in the case of the maned three-toed sloth; home ranges often overlap. A single tree is sometimes home to several females. Unlike most mammals, the sloth's body temperature is unstable and ranges from 74 to 92 degrees Fahrenheit. To raise their temperature, sloths will seek the sun-exposed crowns of trees. To cool down, they may move into the shade of climbing vines known as lianas. Most of a sloth's existence -- around 15 hours a day -- is spent hanging upside down from trees, a lifestyle made possible by claws that are long and curved. Two-toed sloths tend to switch trees on a nightly basis. Sloths descend to the rainforest ground about once a week to urinate and defecate. Able swimmers, sloths will sometimes drop into a river, where they much more dexterous than on land. All sloths are herbivorous, but two-toed sloths have a more varied diet that includes leaves, twigs and fruit, whereas three-toed sloths feed exclusively on leaves. Both species obtain most of the water they need from the vegetation they consume. Three-toed sloths have been largely observed feeding in cecropia trees, which they help fertilize with their excrement. Feeble hind legs render sloths incapable of walking. On the ground, they must drag themselves on their bellies. At these times, sloths are defenseless against predators, which include cats like jaguars and ocelots, as well as anacondas. Up in the trees, sloths are hunted by harpy eagles. Because they spend so much time immobile, algae often grows on their coats, which helps to camouflage sloths against the surrounding foliage. In What Regions Do Chameleons Live?